So, it would seem that a lot of people have many of the same questions. I’ll do my best to answer as many of them as possible and try to skip too many, “we don’t know” responses. The truth is there’s still a lot we don’t know about the trip, about where we will be when, about how things will go and many other things. But, we’ve got some guesses on many of those things so I’ll give those and try to make it sound like I know what I’m talking about (I don’t). Are you crazy? I am, Laura isn’t. Actually, we get that question with some frequency. We’re not crazy, I promise. This is a trip I’ve wanted to do for quite a few years now. A change in Jobs, the kids’ ages and a confluence of a host of other factors makes the trip possible. Many people do this trip in retirement and are frequently limited as to what they can do by circumstances of health, we are fortunate to be able to do the trip when we are young(ish) and healthy. What is the great loop? 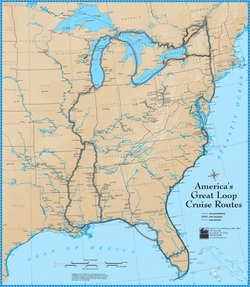 The great loop is a trip comprised of the waterways of the eastern third of the United States. Depending upon where you live you can start anywhere on the loop. What route will we take? We will start in Chicago as that’s our home port. From Chicago we will go down Lake Michigan to the Calumet River, through the Thomas O’Brien locks to the Little Calumet River, to the Illinois Sanitary and Ship Canal to the Illinois River. Once on the Illinois River we will continue until Grafton, IL to the confluence of the Illinois River and the Mississippi River. We will take the Mississippi past St. Louis to Cairo Illinois, the confluence of the Mississippi and Ohio Rivers. We will then take the Ohio to Kentucky Lake and enter the waterways of the Tennessee Valley Authority. Kentucky Lake will take us to Lake Pickwick and then the Tennessee Tombigbee waterway and on to the Black Warrior River before making our way out onto the Gulf around Mobile, AL. We plan to enter the Gulf shortly after November 1st and the official end of hurricane season. Once on the Gulf we will have the choice for much of our Eastbound trip of going inside on the ICW or out on the Gulf. We will stop and spend some time with my Uncle Tom and his family before continuing to the south of Florida. We plan to spend the holidays around the Keys. From the Keys we are hoping to make our way to Havana and see Cuba before commercialization really changes it. From Havana we will return to the keys and then continue around Florida. Once through Miami and Ft. Lauderdale we will make our way over to the Bahamas where we plan to spend several weeks to a couple of months. As spring begins to hit the east coast we will begin to make our way back north and head up the eastern seaboard. That trip will take us up the east coast entering the Hudson River in New York, taking that north to the Erie Canal. We will then likely take the Erie Canal to Lake Ontario before taking the Welland Canal from Ontario to Erie. Once on Erie we will follow a route we and our boat have done before taking Erie to the Detroit River to Lake St. Clair to the St. Clair River to Lake Huron. Once on Lake Huron we head up to the Straits of Mackinaw then make the left turn to head south and arrive back on Lake Michigan and our home waters. How far is the trip? Depending on how many side trips we do the trip will likely be between 6,000 -8,000 statute miles. You aren’t going the whole way down the Mississippi? When I first started dreaming about this trip part of the allure for me was the romance of going the entire way down the Mississippi through Memphis to New Orleans. As we started planning the trip and I read more I learned that the lower Mississippi isn’t a particularly scenic waterway and it’s not very friendly to recreational boaters. There are very few services and in fact there’s a stretch of over 400 miles with no fuel or services. The route through the TVA is supposed to be much prettier with great marinas along the way and plenty of access to services as we travel. So, reluctantly I let go of my dream of going the whole way down the Mississippi and let the experience of countless others help us make the decision. I suppose part of the reason for the desire to head down the Mississippi is that my favorite vacation as a kid was a trip we took on a houseboat on the Mississippi. I loved every minute of that vacation while the rest of my family was far less enthusiastic about our bug infested run down boat. Will we be travelling every day? No. At 7,000 miles for the trip we need to average less than 20 miles per day. We will have plenty of days in which we cover 100 or more miles and plenty of days in which we sit still. We are building in lots of time for days in which the weather isn’t good enough to make travel pleasant. Will we be safe? We certainly think so. I’ve taken lots of precautions in preparing the boat, outfitting it with all the safety gear I think we could possibly need. The boat is very well maintained and in good mechanical shape. We are taking lots of spare parts and tools with which to make repairs underway. Lastly, no part of this trip involves long open water passages. The longest passage we are likely to make is less than 150 miles. Who is going to teach the girls? Umm, Laura and me. The good news is that Laura is a teacher and very patient. The bad news is that I am neither of those things. We think the experience will be an amazing one for the girls. They will see more of the U.S. in a short period of time than just about any other way. We hope that the experience of teaching our own children leaves everyone still speaking. Will we stay in Marinas every night? No, we won’t. There are stretches on the rivers where there aren’t marinas available. That might have us tying up to a town wall or sleeping at anchor. This prospect makes Laura particularly nervous but we will have ample alarms set on the anchor and take a very conservative approach utilizing anchor watches as necessary. Additionally, there are places on the trip where we have been told the beauty of the anchorages available is simply not to be missed. Lastly, there is the question of expense, it is not cheap to keep the boat at a dock every night and when feasible we will probably look to skip a few nights incurring that expense. In total over the course of the trip I suspect that a great majority of our nights will be spent in a marina. Do we have the right boat? Is it too big? Too small? For this trip our boat is among the larger that make the trip. We fit under all the bridges (one just outside of Chicago by 2 inches!) and should have enough water under the boat everywhere we plan to go. Because of our size we will sometimes find fewer docks available for us and perhaps some marinas in which we just don’t fit. On the other hand will have the luxury of travelling with a great number of creature comforts and the ability to bring most things we want and need. Ours is not the most stoutly built or capable ocean going vessel. That will enter into our planning and my thinking as we make go / no-go decisions. I’m sure I’ve missed some questions. Please feel free to ask away and I’ll get them added.